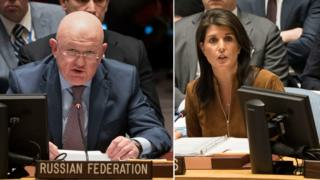 The US and Russia have traded barbs at a UN Security Council meeting on the alleged chemical attack in Syria. Russian representative Vassily Nebenzia said the incident in Douma was staged and that US military action in response could have "grave repercussions". US envoy Nikki Haley said Russia - a Syrian military backer - had the "blood of Syrian children" on its hands. Earlier, the UN human rights chief said world powers were treating chemical weapons use with a "collective shrug". 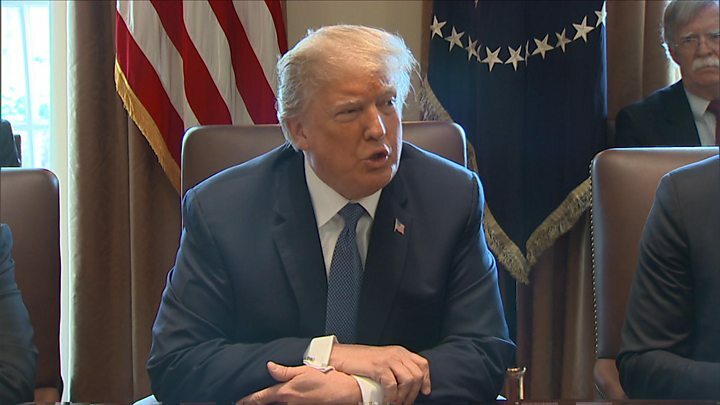 US President Donald Trump pledged later on Monday that the incident would "be met forcefully", adding that the US had a lot of military options and a decision on a response would be taken "tonight" or "shortly". Calling Syrian President Bashar al-Assad a "monster", Ms Haley said that if the UN Security Council acts or not, "either way, the United States will respond". "Meetings are ongoing, important decisions are being weighed even as we speak," she said. 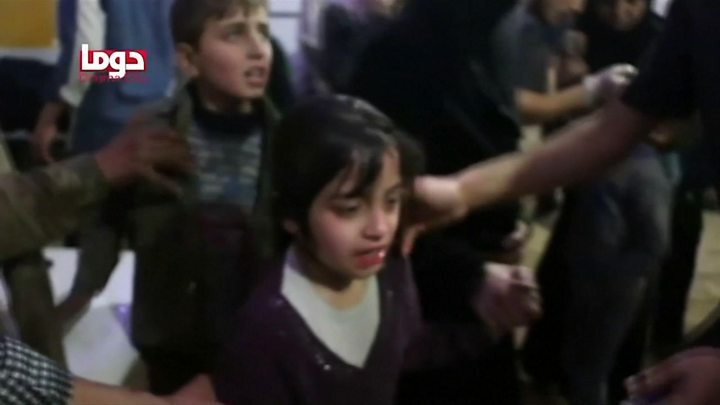 The Syrian-American Medical Society said more than 500 people were brought to medical centres in Douma, in the Eastern Ghouta region, near the capital Damascus, with symptoms "indicative of exposure to a chemical agent". Mr Nebenzia, presenting Russia's case that rebels in Douma staged the event for their own ends, painted the incident and its fallout as part of a US-led effort to hurt Russia with a "broad arsenal of methods", including slander, insults and "hawkish rhetoric". 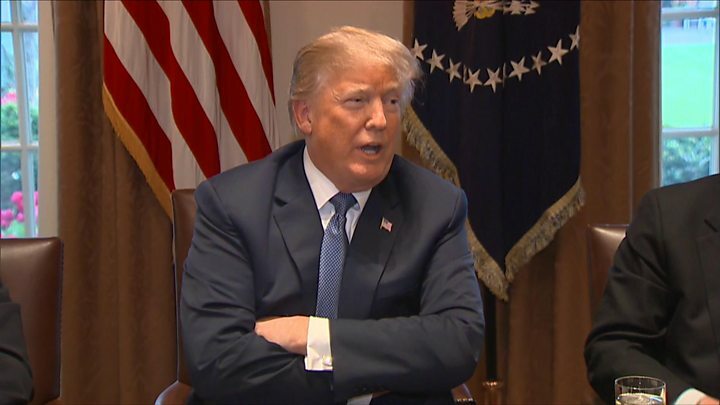 "Armed force under mendacious pretext against Syria, where, at the request of the legitimate government of a country, Russian troops have been deployed, could lead to grave repercussions," he said. Analysts say this is President Assad's biggest military success since the fall of Aleppo in 2016. It follows a weeks-long government offensive in which more than 1,600 people were killed.